Additionally, many people also participate in food stamp programs. Several of our Austin famers’ markets can now accept debit cards and food stamps from the Women, Infant, and Children (WIC) Farmers Market Nutrition Program (FMNP) or food stamp (Lone Star: SNAP) programs. We learned that applying for food stamps is time consuming and challenging with a 22-page application that needs to be re-submitted every three months. A maximum benefit is about $200 per month. By blogging about the CAFB, we’re hoping to raise Hunger Awareness and encourage donations of food, money, or time to local food banks. On Saturday May 8 in central Texas, the US Postal Service will be collecting food donations for Stamp Out Hunger, and all of the food collected here is used locally. Each of the local bloggers involved has taken a different approach to this project, and everyone involved is listed on the CAFB blog. I wanted to cook a big, healthy meal with some ingredients that would be part of a monthly food pantry pick-up and some that could be easily found at a farmers’ market. The items from the list above that immediately jumped out at me were the beans, rice, and pickled jalapenos. At the risk of heading straight for the dreaded, hippie-food territory, the fact is that 'beans and rice' is comfort food for me. I wanted to include a healthy green vegetable as well and make a meal that would produce lots of leftovers. I’m not sure if these are collards-enchiladas or southwest-cabbage rolls. I’ve made cabbage rolls a lot of different ways using standard green cabbage, napa cabbage, and leaves from different greens like chard, broccoli greens, and collards. I like using collards because the leaves are usually big and somewhat round. I’ve made more traditional rolls with tomato, lemon, and dill sauce. I’ve made them with ground turkey, I’ve used brown rice, and I’ve made them before with the same filling used here. Cooked pinto beans, rice, and shredded monterey jack cheese were on the inside, and the sauce was a puree of simmered anchos, onion, and tomato. Admittedly, I made this more complicated than it needed to be, but let’s pretend that was just to show the possibilities. It's somewhat labor-intensive, but a few steps can be prepared a day or two in advance. Also, while I did make a sauce from scratch, a prepared enchilada sauce would work just as well. 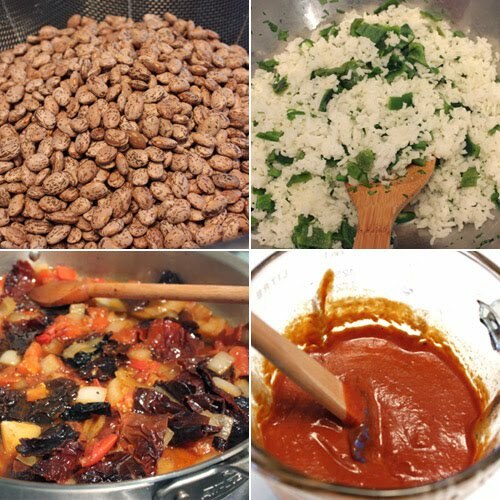 I cooked the pinto beans a day in advance, and I added half of a large, sweet, Texas onion and a few dried chipotles to the water as the beans cooked. The chipotles gave the beans a hint of smokiness and a little spice. The rice could have been made a day or two early as well. I roasted poblano chiles to add to the rice, and I stirred in some chopped cilantro from my garden, but it could have been left plain. For the ancho sauce, I sauteed the other half of that sweet onion, chopped of course, and then added seeded and chopped dried anchos and two chopped tomatoes. After that simmered with water long enough for the chiles to re-hydrate, I pureed the mixture until smooth and added lime juice. I served the rolls with pickled jalapeno and pickled carrots on top with a little extra finely grated cheese. From three cups of cooked beans, one cup of rice, and one half pound of cheese, I made 20 rolls and still had some leftover rice. Not only did we have a healthy dinner full of spicy flavors and melty cheese, we also have several lunches covered for this week and a few rolls in the freezer for another time. - In a small saucepan, bring two cups water to a boil, add rice, reduce heat to low, cover and simmer until rice is tender, about 20 minutes. Turn off heat and let rice sit for 10 minutes. Place rice in a large bowl and fold in chopped, roasted poblanos and cilantro. Set aside. - For the sauce, heat vegetable oil in a large saute pan over medium-high heat. Add chopped onion and cook until tender and just starting to brown. Season with salt and pepper. Add chopped anchos, tomatoes, and one cup water. Reduce heat to low, cover pan, and simmer for 10 to 15 minutes or until anchos are tender. Remove from heat and allow to cool. Transfer mixture to a blender, add juice of one lime, and puree until very smooth. Taste for seasoning and adjust as needed. -Bring a large pan of water to a boil. Place collard greens leaves, a few at a time, into the boiling water. You can hold them by the stem and leave the stem sticking up out of the water. Let the leaves boil for about one minute until softened. Transfer to a sheet pan and repeat with all leaves. Let the leaves sit on the sheet pan until cool enough to handle. - Coat two baking dishes with vegetable oil. Pour half of the ancho sauce into each baking dish. - Place a collard leaf on a cutting board and cut away the thick part of the stem. The stems can be chopped and cooked for another dish, but they’re not needed here. Place a big spoonful of rice in the center of the widest part of the leaf. Top the rice with a big spoonful of beans, and then add some grated cheese. 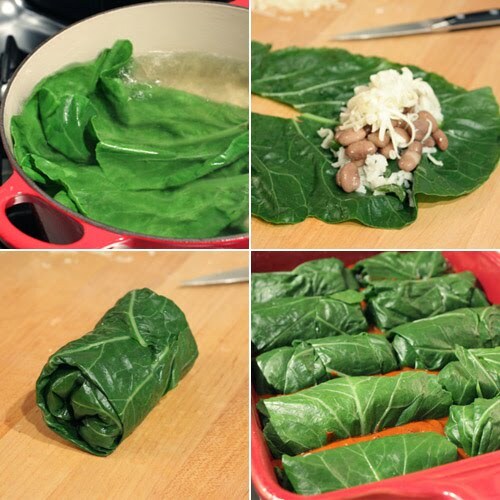 Fold in the leaf on each side and roll into a bundle and set the rolled bundle into the sauce in a baking dish. Repeat with all leaves. The pans I used fit 10 rolls each. - Cover the baking dishes with foil, and bake until warmed through, about 20 to 30 minutes. Serve with sauce from the pan, a little more grated cheese, and pickled jalapenos. arent collards just perfect for stuffing and rolling?! love this! I love cabbage rolls- love the idea with this!!! great post, lisa! what a fantastic way to incorporate many of the food items on the list we received. i also appreciate the quantity of servings it makes: a main dish for several folks with leftovers to boot! I really love that combination! a great idea for a healthy meal! 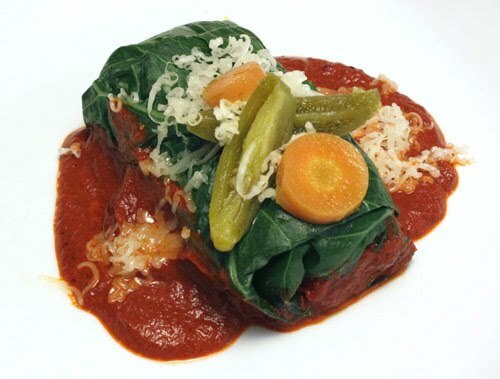 What a great twist on the classic cabbage roll. Collards are so much more vibrant in color, too. A healthy dish that looks gorgeous, too! 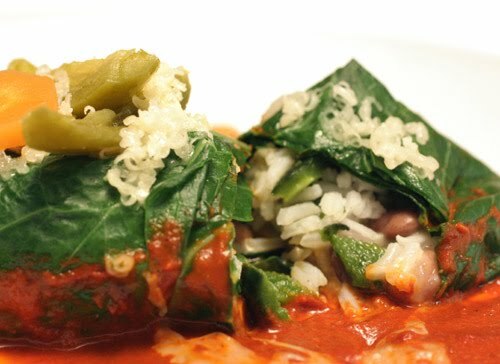 Lisa, I never had collard green rolls, sounds and looks delicious...it sure makes a great meal :-) Great pictures! Very nice post Lisa. I applaud your community efforts and I love your Mexican (Latin) variation to the classic Eastern European stuffed cabbage rolls. Good choice on the collard greens. I find them to wrap easier, too. Fantastic job!! These look delicious and using all local ingredients. i make an indian rolled collard called pathrode. it is great to stuff. and what a wonderful cause! bravo. what a great production! i could look at that list of ingredients for hours and never come up with anything even remotely as awesome and appetizing as this. good work, lisa! Congratulations for participating in such a worthy cause. We stuff cabbage rolls, swiss chard and of course vine leaves. This is such a great idea to stuff them with rice and beans as well. They look fabulous, I am coming for dinner daaaaahling, please set me a plate... a big one. I like to use Chinese cabbage to make a similar dish. Collards are great too. I did volunteer at a food bank in Canada with my son and it was a great experience. We see the world with different eyes now. It's not much what they receive. The list is different in Canada. Love what you made. Wonderful TexMex way to do collard greens. For a traditional green, this is a new way to see them. What a beautiful looking dish, and a great idea to use food bank ingredients in a new way. I love cabbage rolls, and all the ingredients here, but I don't think I've tried collard greens, so I'll have to look out for them. You came up with such a creative and delicious dish! You're very kind for blogging about this cause. These collard greens rolls look fantastic and the sauce is excellent! Oh what a coincidence-I made collard rolls (Indian style) just yesterday. Will post it soon. What a wonderful recipe and a great cause - just goes to show what you can do with basic ingredients for a healthy and inexpensive meal. And a beautiful one, too. 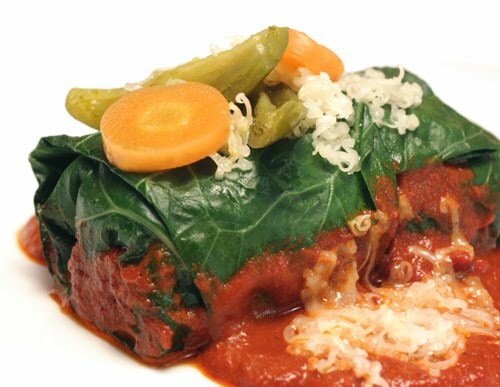 What a great idea, I grew up with cabbage rolls, but let me tell you they did not look like this - love the interpretation of the collard greens and of course anything made with ancho chilies is talking to me. This is such a wonderful way to raise awareness of such a great cause. Your meal sounds so incredible!